A trend doesn’t only talk about fashion but also to random stuff in general. Catch this latest spa craze now trending. After a week of being a busy bee, I give myself a time to spoil a little and one thing that bumps in me that I surely want to experience is pampering my self. It is so common to us that talking about pampering, we geared up and head over to the nearest spa center or salon but what lacking to us is to experience a new way of being pampered and that is to try Fish Spa. Sugar and Spice just launched in GenSan and welcomed the generals on their soft opening last February 28, 2013. A new and exciting alternative for health and beauty treatment. This latest addition to the tenants of East Asia Royal Hotel uses toothless Garra Ruffa Fish to safely and gently exfoliate the feet. Sugar and Spice is the first and only place in GenSan that uses these renowned fish to safely and gently exfoliate feet. The fish clean pores, remove dead skin cells and also serve as a micro massage for the feet and legs, improving blood circulation. The experience is slightly ticklish at first, but skin instantly becomes softer and smoother. On top of that, you won’t feel even the slightest pain or discomfort just opposite – you will get incomparable pleasure. 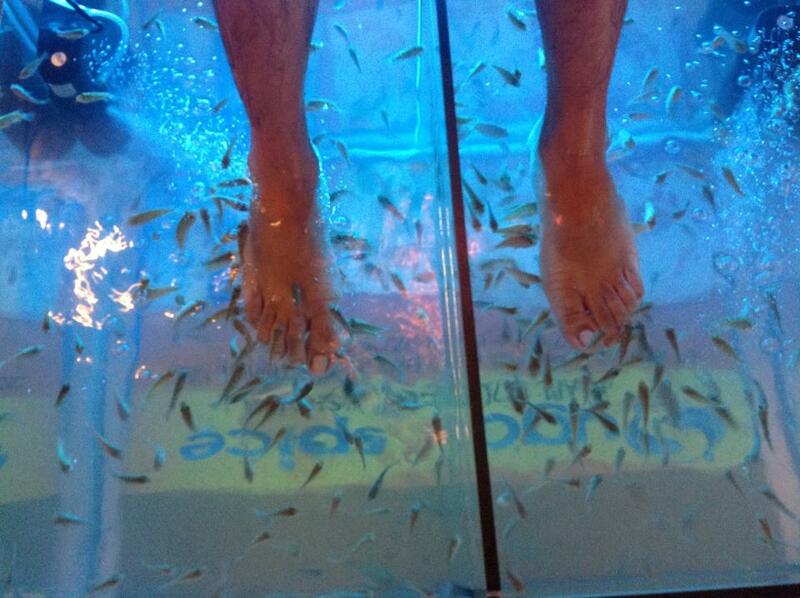 Immerse your feet into a warm water tank for a “toe-tally” organic foot treatment. Experience the wonders of Tropical Garra Ruffa Fish or also known as the “Dr. Fish”. The Gara Ruffa Fish can also stimulate acupuncture points, which help regulate the nervous system and give a complete body relaxation. Fish therapy, like any other cosmetics therapy, is recommended for regular use. For better results several procedures are required, although results can be seen and felt right after the first procedure. The fish cover the surfaces of skin from all sides, not traumatizing skin but skillfully removing dead tissues. It can be called as fish therapy, laughter therapy and peeling; all in one single package. A therapist will wash the customers feet and ankles prior to entering the Fish Spa tank. Clear any foot garments and even fresh nail polish are not allowed. Any items dropped into the tanks should be recovered by a member of staff. Once you are seated please remain seated – wait and look for assistance before leaving the tank. Food and drinks are not allowed while having the fish spa. 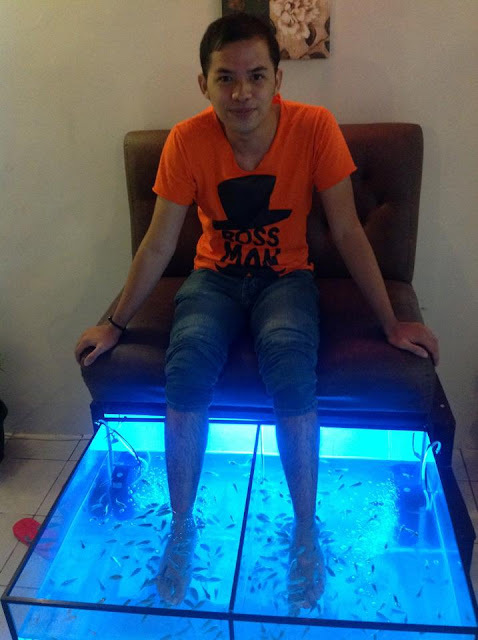 However, you can take it right after or during your foot massage session which actually part of your Fish spa package. Do not dip your feet on the bottom of the tank. You're not allowed to touch the fish nor put your hands inside the tank. Do not move or shake your feet vigorously to avoid any harm to the fish. Such procedures are recommended for people with high irritability, insomnia and those subjected to regular stress. The Sugar and Spice Fish Spa is for all ages. Experience this different way of self pampering for only Php200 including foot massage plus with coffee or tea. Visit them now at East Asia Royal Hotel, 2nd floor, above Giacominos Pizza Restaurant.